Dreamer: The Making of Dennis Wilson's "Pacific Ocean Blue"
40 years since its initial release, Dennis Wilson’s Pacific Ocean Blue, the first solo album by a member of the Beach Boys, is widely regarded as a cult masterpiece, a stark confessional vehicle of naked primal emotion and deep pain. Dreamer: The Making of Dennis Wilson’s Pacific Ocean Blue is the first book devoted to the creation of this seminal rock and roll classic. Via extensive interviews conducted with many of the record’s main principals numbering songwriting collaborators, engineers, session musicians, record company personnel, management, fellow Beach Boys, friends, family, music writers and more, the 415-page book is structured as an oral history and chronicles the fascinating back story behind this extraordinary album. Decades on, the album has garnered raves in the press with the 2008 CD reissue selected by the likes of Rolling Stone, Mojo and Uncut as reissue of the year. 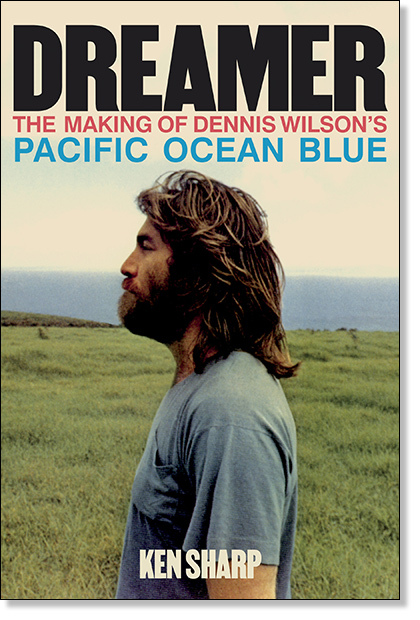 Dreamer: The Making of Dennis Wilson’s “Pacific Ocean Blue” is available exclusively at ken-sharp.com. Due to inconsistencies in shipping costs between the U.S. and abroad, buyers to pay actual shipping costs per order. To order please email Ken Sharp directly for further details.